Pros: For staff to find a policy is easy with key word search or by folder. Cons: I would like to be able to add other category sections without more purchased services. (such as other items for staff to have full access to and be able to search. The main Cons we have 1)setting up projects each time is extremely time consuming. All of the previous items, titles, names should come back prefilled and simply make a date change. 2) When staff go to complete their task, it is frequently just "updated" and we have to call and walk through it each time; when you click on "My projects", the screen should either be blank when you access it or not have to click on author/approver under my tasks first. The two step process is confusing when they already see their policy on the right side of the screen and try to work on it from there. Overall: Very happy except the items described below. For group sign off situations such as our Shared Governance process where there are a group of leaders who complete a sign process after concensus, is there an easier way to have numerous signatures at one time. Pros: I really like the fact that we don't have to sign in to see the policies. There are so many passwords to keep track of, this makes it so much easier for staff to find a policy quickly. I also like the fact that we can circulate a policy to be in other folders and when its updated it auto updates in the folders as well. Cons: Sometimes when I'm updating several policies the program will stall out on me. Overall: Before this program our policy tracking and updating was a nightmare. With this program we now can keep better track of policies needing review and holding people more accountable. The report's are great and very helpful. There is so much more to this program that we have not even touched on as of yet, we are working toward linkage of forms and websites like Elsevier. They are always adding great new features, I have been very pleased with this program and would highly recommend it. Product is easy to use and as an administrator I can help users with their projects even by phone. Pros: Our general users are able to search for a policy and find it easily. I can train users in less than a half an hour how to create a project and see it through the approval process; they are surprised that it is so easy to use. Our laboratory uses the digital signature and attestation features to comply with CAP requirements. And the customer service is great, they get back to me right away. Cons: I wish I could copy a workflow when creating a new one instead of creating a new workflow from scratch. Our committees are really how a policy goes through the approval process so workflows are created for each committee and sometimes a committee needs more than one option for a workflow. But with all the upgrades that PolicyMedical makes for its customers I am sure that it will happen sometime soon. Overall: It was easy to use to complete a recommendation for a product used at our hospital. Latina, thanks for the feedback. Definitely! Your voice counts. We hear you on the workflow issue and know how burdensome workflows can be. We have opened up a ticket to see how best to address this enhancement request. Our Customer Support team will get in touch with you as to the status of the enhancement request. Pros: Lots of functionality and great tutorials. If you are willing to spend a few minutes to get to know it, the system is very intuitive. Cons: Not being able to lock down specific documents to specific people. For example, if I grant a user privileges to edit a document, they have the ability to edit any document without the document owner's approval. Would be better if edits to existing documents could only be initiated by the document owner. Overall: Great program, but switching an entire organization to a new document management system is incredibly complex and difficult. I wish I could say the transition has been cleaner, but I don't think it has anything to do with the PolicyManager system. Hi Jake, thanks for taking the time to write this review. Per your comment about locking down the document, you can place users within their respective departments and you can restrict a document so that only a specific set of departments can view and edit the documents. If you would like more details on this functionality, please reach out to us at support@policymedical.com. Pros: This software has enabled us to move from a paper system to an almost paperless system. It is a great way to manage policies and keep on top of expiring policies. Cons: I don't know that I can really say anything bad about the software. We have had a few little bumps, but have always been able to easily work through them. Overall: PolicyManager's support is great! They are very responsive to any requests I have made, and I feel I can easy call them and receive in-person help. I feel they are willing to go above and beyond to have happy clients. Cindy, thank you for your feedback. You're right happy customers are definitely our number one priority. If you're not happy, we're not happy. Our customer support and client success teams pride themselves on being responsive to our customers' needs. Great to hear that PolicyManager is helping you make the transition from paper-based policies to an online repository that you staff can access from anywhere. This is a great tool used for big or small organizations. Pros: What I like most about the product is that its user friendly, has videos to assist and demonstrate certain features. I do like the Projects peace to help track any changes to a policy and create new policy. It sits in one system where you don't have to go digging for it in another area. Cons: Being in a big organization, the downfall is carrying a department specific policies and sometimes catering to each department need can complicated. I think the con here is the option to revert back to something when it was done on mistake for System Admins but I can also see why that option is not available. Ajeshni, thanks for your feedback. 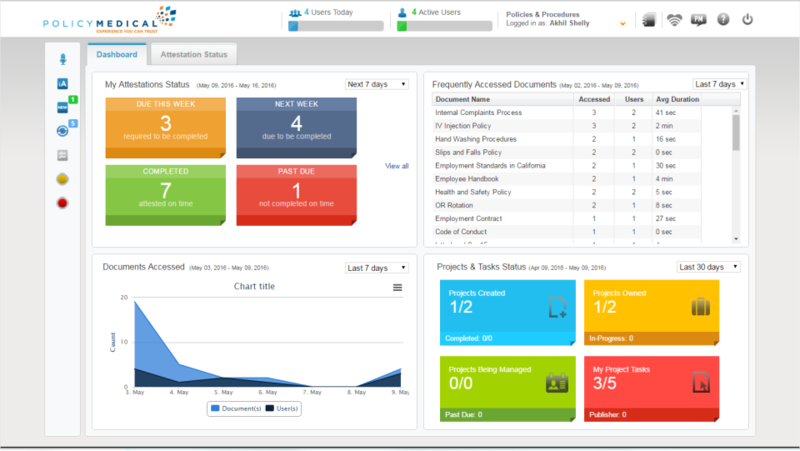 Glad to hear that PolicyManager is user friendly and that your team is realizing the benefit of using an enterprise policy lifecycle management solution. We enjoy collaborating with you and your team. Easy to use! Great way to house all of our policies & have them all easily accessible to our staff. Pros: I can control who edits, who publishes and which version is posted. Implementation was easy and we were well supported by the team at Policy Manager. Cons: Need to find a way to easily print an entire manual. Currently we have to print policy by policy in the manual. Linda, thanks for your feedback. We understand the inability to print an entire manual is an issue. This has been an item that has been brought up a number of times by our user community. We have done extensive research on the topic and the limitation is the Windows OS functionality evoked when calling the print function from the browser. Our development team, as part of our product roadmap, is looking into how best to address the issue by developing a separate module to allow printing of a ¿P & P Manual.¿ As soon as this functionality is available, we will be sure to let you know. We love the stop light colors for policy due dates. Cons: The process for involving others in the policy development. We found it to be a bit clunky for us. Overall: We are complaint for policies according to our accreditation agency. This system worked for us to solve the issues we had with policies. The end user has found it easy to navigate. Customer support is very good. We receive timely updates to the software. Cheryl, thank you for taking the time to write this review - we appreciate your feedback. Sorry to hear that you find the policy development process a bit clunky. Our team will reach out to share some tips on how to streamline this better moving forward. Pros: The ability to hold staff accountable for policy review through attestations. Customer service response is quick. Ability to track progress on projects is helpful. Cons: The editing feature within projects is a bit clunky. Would like to see an option for header feeders and the ability to free text dates rather than selecting from a calendar. Tara, thanks for the feedback. There is good news on the horizon with regards to the editing feature issues mentioned. We recently completed migration from eDrawSoft to Office Online for online document creation and editing. This gives us access to other feature sets thru Office Online for inserting certain meta data fields into headers and footers of documents as opposed to how we currently do this. We will be looking into these capabilities further in 2018 and will keep you posted on enhancements. Also, as part of the new user interface revamp which is underway, the ability to free text in calendar fields is included. Hi Ashnia, thank you for taking the time to write a review for PolicyManager. Sorry to hear that you find creating projects and assigning people is tedious and time consuming. Potentially creating Project Workflow templates could help increase productivity and save some time. Here is the link to our step by step guide https://policymedical.freshdesk.com/support/solutions/articles/1000108689-workflow-templates. The guide can be found on our support portal. If you would like to speak to our support team to get an in-depth overview of the workflow templates, please contact them at support@policymedical.com. They are happy to help. Pros: This software is user friendly and easy to teach to new employees. Every time I have had an issue, the support has been quick and efficient and all issues resolved well. The support staff at Policy manager are very efficient and kind in their interactions. Cons: I really have no issues with this software. I would highly recommend policy manager. Overall: I have had great success with policy manager. As a person who updates policies and creates new policies as well as accessing them daily, I would highly recommend policy manager. The software is user friendly and easy to teach to new users. Krisa - thank you for taking the time to write this review and provide us with your feedback. Have a great day! The search feature is great. It makes it easy for any employee to find the policy they need! Pros: The quick edit feature is wonderful. Very quick and easy to edit and update your policies. Very short learning curve for any registered user. I have really enjoyed that each department can now have access to keeping their policies up-to-date; reminders are automatically sent to them when the document needs to be reviewed; uploading new documents is a breeze; digital signature is a nice feature. Cons: Project mode is a little intimidating. Wish there were less steps involved in setting up and using this feature. Overall: Organization with our policies and procedures; consistency within the facility. Jana, thank you for your feedback. We will be in touch to discuss your issues and needs with the Projects feature. We can assist by providing some additional educational resources and best-practice approaches. The Projects feature is currently on our Product Roadmap for redesign. It would great to review the proposed changes with you to see if they will successfully address your needs and include your feedback in our design input. Our team looks forward to collaborating with you. Policy Manager staff are most helpful when issues arise. The Software is simple to use. Pros: It helps us attain our goal of document control, which is an ISO 9001 requirement. Policies are reviewed and updated in a timely manner due to email reminders. Cons: Would like for the reminder emails to show the entity that the user uses, instead of the first entity listed in alphabetical order - this is confusing to some people. We have 12 entities at our health system. Overall: Easy to use. Aids in maintaining document control of Policies. Linda, thanks for your feedback. We have opened up a ticket regarding the reminder emails to look into this issue and our Customer Support team will get in touch with you as to the status of the enhancement request. Pros: It's very user friendly. Overall: Working with Policy Medical has been great. The customer service is phenomenal, they reply to you within hours. The system is very user friendly and easy to navigate. I like the idea of having a generic sign on for staff so that they have one less password to remember. Having an electronic system for policy reviews and projects is great, we no longer have a paper trail that at times would get lost on someone's desk. If you have any ideas for improving the system you can submit them, we have had a few of ours implemented. They are very receptive to new ideas and they are always updating and improving the system. Great company to work with! Pros: Many functions to personalize to your organization such as folder creation, and role creation which makes it easy to use. Cons: No clear directions on policy flow. Many steps that have to be completed to just do an annual update. Tracy, thank you for your feedback on the policy flow functionality in PolicyManager. We will be in touch to discuss your issues and needs. We can assist by providing some additional educational resources and best-practice approaches. Several core features of PolicyManager are currently on our Product Roadmap for redesign. It would great to review the redesign with you to obtain your feedback and determine if the proposed changes will address your needs and include your feedback in our design input. We look forward to collaborating with your team. Pros: Easy to use. Good search features. I like the ability to use software for policies and other key documents. Cons: Would like to have more ability to customize fields and change defaults/ required. Overall: Overall it has been good. We would have liked to have had some guidance in establish process behind the software. Some lessons learned form other customer sites. Stephanie, thanks for taking the time to write a review about your experience using PolicyManager. We are glad to hear that you find the platform easy to use and are enjoying the advanced search functionality. PolicyManager's customer service and flexibility is impeccable! Pros: Ease of use, the way the software is set up, and overall functionality of the software. Cons: The search functionality could be a little more intuitive. Overall: PolicyManager's customer service is exceptional. They are always willing to assist you with an issue and also assist with customizing the application to fit your organization's needs. Kelly, thanks for taking the time to write a review for PolicyManager. We love working with you and your team. Pros: The customer service and response time I have received has been wonderful! - CSV data import - in order to replace past users or move current users to different roles etc. instead of having to use the find & replace, which is not always successful OR having to manually go into each policy to make the change. - Being able to have one login for a person who manages multiple committees, with the ability to then toggle between the committees via that one login. - Report that shows communication history added after uploading a new document, in the box 'Document Uploading Confirmation'. Pros: The software support is great. Since they are a small company they have been very responsive to our needs, working closely with us to update the program to meet the needs of our organization. Cons: There are several pieces of the application that are clunky, but they continue to improve the processes. Pros: This software allows our organization to organize all of our important policies and plans under one roof. Before this, there was a paper trail that was easy to misplace and took long periods of time to implement changes in policies. Now, we can do it all with a touch of the button and the results are done and implemented electronically. This helps with time-sensitive issues and accountability. Cons: I really don't have any dislikes about this software. Compared to what I knew before using this software, I don't know why we waited so long to get it. Cons: I wish it could be cleaned up easier. Pros: Good helpful people from start to finish. We make the mistakes, Support fixes them in a flash! Love the Training/Support module. Cons: Bit of a learning curve - but that's expected. Overall: Worked with PM since version 3 or 4 (it's been a while!) excellent product, great support, priced right. Recommendations to other buyers: Themes! Thank you for the kind words Marguerite. We're always glad to help! Cons: One challenge that we have found is working on projects with multiple reviewers/editors. The project process seems to be very linear and does not have as much multitasking functionality as we would like. Dear Customer, thank you for taking the time to write this review and provide us with your feedback. It is greatly appreciated. We did want to point out, that in PolicyManager you do have the ability to assign multiple people to a single task. Our support team would be happy to share best practices and hands on support to walk you through this functionality. They can be reached at support@policymedical.com. One of the reasons that the product takes a linear approach for projects is to act as a guide to ensure that all tasks are completed in an orderly fashion and no tasks are missed. However, maybe this does not work for everyone. We would love to hear more about your thoughts on how we could take a different approach and what would be acceptable for your user community. Pros: I don't have to wait for someone to get me the info in order for the policies to be added to the Medial Executive Committee because it is already on the site and I can download it from there. Overall: It is easier and usually faster to get the information from Policy Medical than to wait on someone else to forward it to me. Cheryl, thank you for your feedback. We will be in touch to get more information on the process you are trying to support. Perhaps we can assist by recommending a different approach or capturing your requirements as an enhancement request. Cons: Not at all impressed by the training. Very difficult to follow and understand why certain things need to happen. Overall: We are very excited to have this type of solution but wish that we were able to implement it much quicker and smoother. The training style, instructor, and resources are not in a well defined package. Training was not 1:1 but instead in a group setting with other clients decreasing the ability to direct training to our specific needs. To date we are still not fully functional with policy manager 9 months after the start of the software. Susan, thank you for taking the time to write a review. We appreciate your candor. We also apology that you did not feel that the training provided the information and overview needed. Your feedback has been shared with our training team and we will do better moving forward at ensuring customers like you receive the information and materials needed during our training sessions. If our team can help you achieve full functionality within your organization, please let drop us a line at support@policymedical.com. Thank you for taking the time to write a review about PolicyManager. Your feedback is appreciated. Pros: Ease of use and folder like structure to display policies. Easy search. Ability to view and/or print document in PDF but also download Word or Excel versions as well. Peter, thank you for your feedback. Pros: It is so easy to navigate through all the policies. I also like the support portal as it is very informative. Overall: The benefit is when policies are changed, I do not have to go around our facility and change it in all the binders, that we use to use. I can change it on my computer and it is instantly updated across the facility on all the computers. Shelley, thanks for your feedback. Glad to hear that you are extremely happy with PolicyManager. It is always great to hear that our customers are realizing true business value from our solutions. Have a great day! Pros: The software is easy to use. The support team is very friendly and helpful. I like that you can contact the support team in other ways than just calling. Cons: Cut/move option has not been working for quite a while for me and has not been able to be fixed yet. Ticket is in and in the works though. Amanda, thank you for your feedback. Our support team has logged a ticket as you mentioned. We are committed to working with you to resolve this issue, as well as supporting your needs until it can be addressed in PolicyManager. We will continue to stay in touch! Thank you for your patience! Pros: Easiest way to consolidate policies electronically. Cons: When you use full edit instead of quick edit and have to go through a lot of steps to get the policy published. Pros: The ease of use for Front end users is a definitely a plus. Staff are more likely to use something that they don't have to spend forever trying to figure out. The attestation piece is an added bonus. Cons: The back end set up is a little less intuitive and can sometimes be confusing especially is using SAML/Active Directory for user names/log in. Hi Jane, thank you for your feedback. We love receiving feedback from our customers. Glad to hear that you find the attestation feature helpful. Our customer support prides themselves on being responsive - so it is always good to hear a customer say they are responsive and helpful. Have a great day! Pros: Everything is simple and easy to use! Customer service and training was great! 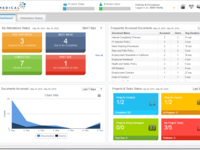 I would recommend this software to any company seeking a policy management site. Cons: There are some restrictions with what the site can do, but overall it does mostly everything we need! Overall: Organization of our policies! It was much needed! Brooke, thank you for your feedback. Great to hear PolicyManager is meeting your needs. We will be in touch to get more information on the restrictions you are experiencing to discuss how we can assist. Entire organization implemented PolicyMedical. My region converted from another program. Pros: Continuous updates every 3 weeks. Our previous program maybe made updates yearly. PolicyMedical listens to our concerns and requests and make program improvements based on our input. Also I now can easily share policies within our organization. Debra, thank you for your feedback. Glad to hear that PolicyManager is helping your organization easily share policies among sites. If you need anything, don't hesitate to let us know. Thank you for taking the time to write a review. Love the "saving trees" comment and glad to hear that you have been able to streamline policies across multiple sites. Easy install and excellent customer support. I appreciate that they keep the customers informed. Pros: The system is easy to use, user friendly our customers rely on having policy manager available 24/7. Overall: all our company policies are organized and in one location. April, thank you for your feedback. Glad to hear that PolicyManager is helping you keep your policies organized in one central online library and that your staff is able to access the policies quickly and easily 24/7. If you need anything, don't hesitate to let us know. Pros: It's very well organized. Easy to use and search for policies. Cons: I don't know if it's able to interact/integrate with other software, but that would be nice. We use SharePoint so it would be nice to have it within there instead of going to a separate site. Overall: It has worked pretty well for us. Didn't take long to get everything uploaded into the system. Users are using it and seem to like it. Pros: PolicyManager allowed us to consolidate policies in one easy online platform, improve version control and help streamline the user experience. Cons: The project mode can be a little clunky. Overall: PolicyManager provided a great onboarding and start up experience. Their team kept us on track and provide valuable insights into getting started with the tool. Dear Customer - thank you for taking the time to provide us with your feedback. Glad to hear that our onboarding process provided value to you and your team. Pros: I like the ease of using the program when it is working properly. It looks very professional and easy for general staff to use. Keeps track of the policies for review. Cons: I feel that the training was okay but could have been geared more to our facility when training our Power Users. Testing should have been conducted or suggested while still in testing mode and then when live was turned on before all general users were made aware. The terminology is a bit different that we are used to but it works out in the end. Overall: Policies are now not being duplicated so we have consistency and policies are being updated. Departments are now having to review policies and it is much easier to do this function. Hi Ann, thank you for taking the time to write this review. We appreciate your feedback and candor. Sorry to hear that the training did not meet your expectations. Our training team is reviewing your input and will take this into consideration moving forward to improve customer communication to set the right expectations. On a more positive note, it is great to hear that you have been able to consolidate and streamline your policies. Should you have any further feedback on our product or processes, please let us know. We love feedback! Comments: The software works very well for our organization. We are still training users but hope to be up to speed by January. First the number of characters in the the note section is limited to 255. This is an issue when we have several users making comments. I tried to enter a summary of one persons comments and was limited. Next are the committees. Is there any way to add a user to all committees automatically if they are more than a General User? This would be for CHOC only not CCMH. I just becomes tedeous to remember who works for CHOC and who works for CCMH. I have received possitive feedback about the program from all who have accessed it. The search engine is great, that is what I get most feedback on is that they can find the policy they are looking for. And we are adjusting our approval process so that policies have to go thourgh the program to be approved. Great program for keeping Policy and Procedures with easy access for staff to review. Pros: Makes sure reviews are done annually by Managers and keeps our P and P's update and current as a result. Cons: Hard to use at times and a lot of repetitive tasks when reviewing multi documents. Overall: Love the program but wish is could be more user friendly at times. Hi Mike, thanks for your feedback. We greatly appreciate you taking the time to write this review. Sorry to hear that find the platform difficult to use at times. I know our engineering team is always working on improving the user experience and they are currently working on enhancing the user interface. Pros: Great job of handling multiple policies and making them easy to manage, update, and audit. Cons: Not as intuitive as we would have liked; took a long time to ramp up to being able to use it with any kind of speed or confidence. Sarah, thanks for taking the time to write a review for PolicyManager. Sorry to hear that you did not have a smooth start. Should you have any questions or need any assistance, our Client Success is happy to help. They can be reached at support@policymedical.com. The Upgrade to Policy Manager has increased our staff compliance of policy review. Pros: Easy in location of policies, procedures, and forms. Search function is a great tool and easy to use and locate items needed. Various methods to organize the policies and materials makes it great to customize for our specific organizational style. Attestation feature is a huge improvement. Cons: Learning new features is a dislike and a like once it is completed. Project module but need to learn it better. Joni, thank you for your feedback. We will be in touch to discuss your issues and needs with Projects and other features of the system. We can assist by providing some additional educational resources and best-practice approaches. We will also ensure you can access our Support Portal which contains a wealth of self-help knowledge resources on all aspects of using PolicyManager. Comments: I have really enjoyed using this website and our Senior Leaders and Management Team have said many times it's user friendly and a sharp application. Many that have come to us from large hospital corporations are very impressed as we are a small, stand alone, community hospital. I am very happy we chose Policy Medical. I also want to say that Yusuf is the best! You have an excellent employee who has helped with everything and even answered my questions when I emailed him a million times and late at night. He has been huge help and a fantastic person. Your support team as well have been responsive and quick to any issues we have had. I cannot say how pleased our organization is with PolicyManager 6 and your Policy Medical staff. Thank you! Pros: I love the ability to organize our policies and link meta data in the background. It helps with the ability to create projects and formal review for policies. Cons: The version control is there, but the naming convention does not make the most sense. Thankfully their developers are actively working on this. Overall: Web based makes it convenient! Pros: Having a centralized place where to find our documentation. Cons: At first glance, it may look hard to use and understand when you are a document reviewer or when you want to propose a modification to a document. Overall: Overall it's a good system that help centralizing the documentation and give easy access for the user. Pros: Policies are all in one place. No multiple edited versions of policies floating around. Cons: Too many emails. Navigation is not intuitive. There are so many steps to set up a policy. Lina, thank you for writing a review and for your feedback. Sorry to hear that you do not feel the navigation is intuitive. The good news is our engineering and UX team are working on a new UI which should improve the navigation. If you have further details relating to the navigation that you would like to share with our team, please send them to support@policymedical.com. We would love to hear from you. Very user friendly and easy to maintain. Comments: We have implemented Policy Medical just over a year and half ago and it has made such a difference to manage policies and procedures, starting at the corporate level all the way down to the specific Homes. We really like the ability to link the url address of each policy to our e-learning platform, this way we can be assured that only the current policy is being reviewed by our employees. Policy Manager Pro or Con? Cons: The functionality of the software, as we have it set up, does not have an option for a "hard stop", so that all who need to sign procedures sign prior to publishing. The use of the software is confusing and lengthy to complete a task. Comments: My personal experience has been "hit and miss" with trying to complete tasks assigned to me. I complete the task and hope that what I did will push it through to the next step but aren't always successful and need to do it again. For those who just need to access the software to read the policies and procedures in the folders that seems to be going great. Is it possible to eliminate some of the steps in "project mode" to make the updating and creating of documents easier? I am tasked with assisting other staff when they have questions on how to do the project side of the software and I find trying to explain it to someone else very difficult and we just end up fumbling through it and hope the it's beign done correct.